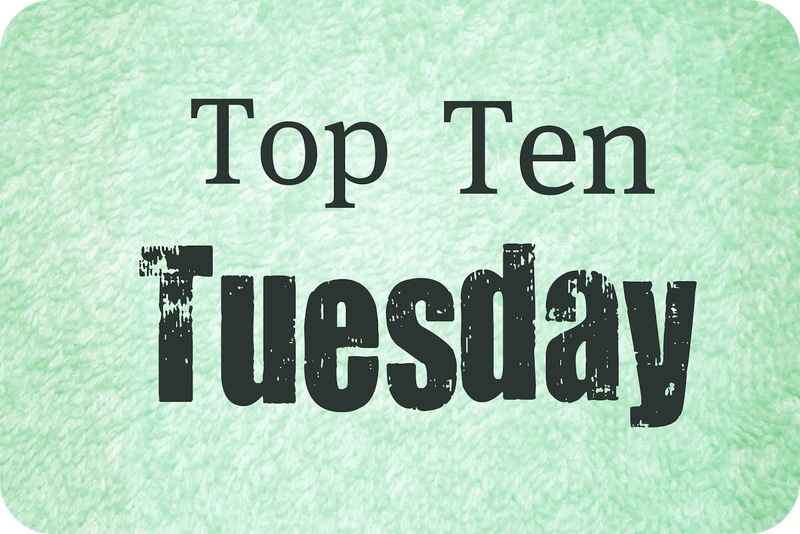 Top Ten Tuesday is an original feature/weekly meme created here at The Broke and the Bookish. This feature was created because we are particularly fond of lists. We'd love to share our lists with other bookish folks and would LOVE to see your top ten lists! Each week we will post a new Top Ten list that one of our bloggers here will answer. Everyone is welcome to join! 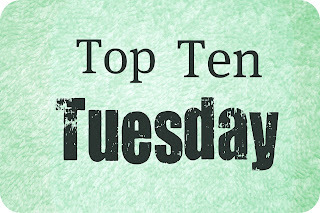 All we ask is that you link back to The Broke and the Bookish on your own Top Ten Tuesday post AND add your name to the Linky widget so that everyone can check out other bloggers lists! If you don't have a blog, just post your answers as a comment. Have fun with it! It's a fun way to get to know your fellow bloggers. Future Top Ten Tuesday topics are posted here. I love quotes. Whether they're from books, songs, movies or people. I love them. I'm always writing down quotes I like on random scraps of paper or pasting them in a blank word document. Those are just a handful of my favorite book quotes! What are some of your favorites? Yay! Glad you enjoyed this week's topic! This is, by far, my favorite TTT topic ever! I adore quotes, and I'm so excited about finding new books based on the quotes people choose. That being said, you've got some great ones on your list! I completely forgot about those quotes from The Book Thief & Anna Karenina, but they were perfect picks. I also like the ones you picked from Anna & The French Kiss (lol!) and Amy & Roger's Epic Detour (so true!). I'm so looking forward to seeing what everyone else chooses :) I couldn't narrow mine down & ended up with sixteen haha! Ooh, this was a hard one - I could have gone on and on and on. This was such a fun topic! At first I wasn't sure if I'd have ten quotes because I didn't think I often wrote them down, saved or remembered them, but in the end I actually had to take a few out! I haven't read any of the books you picked from (several I've been meaning to), but I think my favourite is #9 - that really resonates! This was RIDICULOUSLY hard! But I wound up reminding myself how much I love some of the old classics. I feel the need now to go re-read some Jane Austen. This is going to be a really fun week - I could see not having a lot of repeats, since even if people pick the same books, they could easily pick different quotes. I love the quote from Anna and the French Kiss. Great list! Love the quotes. I couldn't manage to keep mine quite as nice and concise as you, though I do have two quotes from Where She Went. Seriously, what an unbelievable, quotable book. And the Anna and the French Kiss one definitely gave me a good laugh. I'll have to write that down. I love this TTT! It was really hard to pick my favorites though, I have so many saved on my computer. It'll be fun to read everyone else's picks! Such a hard TTT! There are so many fantastic quotes and it was so fun going through all my favorites. Your Top Ten has reinforced my need to read Anna and the French Kiss and the Book Thief! You need to go read both of those books ASAP! Oh so many good ones! and a few that confirms that I need to get through my to-read list much faster. Thanks for the fun theme. Wow! This one's a very hard TTT. I have so many favorites. I also love those quotes from Anna and the French Kiss & Where She Went, although I have different quotes for those two books that made my list. This really is a great TTT. I get to see many quotes. And I've already seen a lot which I'm sure I''l write on my quote book. This is one of my favourite memes of all time, I'm sure you guys could get away with having at least two quote-Tuesdays per year! I tried doing something different , and did my quotes graphically. And I also have an Atticus quote! Aren't we going to have problems for copying quotes to do this blog post this Tuesday?I mean there is possible authors and labels to accuse us for it? Great topic, looking forward to seeing everyone's quotes. I love the Atticus Finch from TKAM.The quote from The Book Thief is such a great one, too (and so true!). I love the quote from The Book Thief! This is one of my favorite TTT topics ever! I LOOOVE your #4! If I Stay and Where She Went are two of my favorite books... and I love Adam so much, especially in Where She Went. Great list! love the quote from anna and the french kiss! These are great quotes! Some of my favorite books are represented here, like The Book Thief, To Kill A Mockingbird, Fahrenheit 451. Extremely Loud and Incredibly Close has been on my list for a while, now. Great quotes! I need to start keeping better track of quotes I enjoy! Great quotes! I especially like the one from To Kill A Mockingbird and Anna Karenina. Also, so many people have been quoting Extremely Loud and Incredibly Close! I need to add that to my wishlist! These are all very beautiful quotes! Love those quotes from To Kill a Mockingbird, The Book Thief, and Anna Karenina! What a fun way to meet new books and remember old ones! I had a good time with this list, too! I think this might be my favorite topic yet; I can enjoy all these quotations from books I haven't read. Usually if someone mentions a book I haven't heard of, I can't appreciate their reason for it being on the list. There should be a rule. No linking before lots of coffee. I added my quotes to another Top 10... sorry about the duplicate. I loved loved this topic and you've picked SO many good ones. It's funny how you can read the same book sand sort of claim different pieces as meaningful to you. Like I read Amy & Roger/Where She Went, and I don't even remember those two. Awesome job and great great meme! Love this topic! It was so hard to choose, but I managed to put together a list! :) I think I need to read The Book Thief, because that quote is awesome! Great quotes! I loved Extremely Loud and Incredibly Close so much. Have you seen the movie? Not yet! Hopefully I'll be able to find it at Redbox next weekend! I love the quotes from To Kill a Mockingbird and Amy and Roger's Epic Detour! It was so hard to choose just 10 this week, haha! What a fabulous way to have begun my day! This is the first time I participated, but it's not likely that it will be the last. :) Thanks to your list and a couple of others I've looked at, my own reading list has been enriched. This is a great idea for Top Ten Tuesday!! I love your quotes. I actually write all of my favorites in a notebook at home, but alas I'm at work and can't remember any word for word! Such wonderful choices! I especially love The Book Thief one. You reminded me how simple and powerful his words were. First, I have to say that's amazing topic! I loved doing this post though it was really hard to choose only ten. I like all of your quotes but I especially liked the one from The Book Thief and To Kill A Mockingbird. I just loved Scout. I had a lot of fun with this weeks Top Ten. I love the quote from To Kill a Mocking Bird and Anna Karenina! Great choices! Great qoutes! I love numbers 7 and 10! I love "The Book Thief" quote! The "Anna and the French Kiss" one made me giggle. Great list! Awesome Top Ten! I love it! I love the quote from I Know Why the Caged Bird Sings. So fitting for her, and indeed, for anyone. I love the quote you chose from Anna and the French Kiss. Reminded me I still need to read that. These are awesome/beautiful/inspiring quotes! I'm reading Anna Karenina right now and am loving it... I don't think I've gotten to that quote yet...I'll be on the look out for it. I would have loved to do this theme this week but all my favorite quotes are really LONG....more like passages. haha! But it's fun to hop around and see everyones! You're quotes are great! It's so hard to pick favorites out of all the awesome ones out there! Great choices! It is a tough one to do because there are so many great options! I loved your choice for To Kill a Mockingbird! Fab quotes! I particularly love the ones from To Kill A Mockingbird and Amy and Roger. If you'd like to check out mine, they're here. Wonderful list! I love To Kill A Mockingbird. Here's my list if you'd like to check it out. Those are all fantastic quotes. I did all of mine from City of Fallen Angels since City of Lost Souls came out today. Fantastic quotes. I love that Anna and the French Kiss one. <3 Palahniuk. yes yes yes at that Anna quote. The Atticus quote came thisclose to being on my list, but I picked a Scout quote instead. “Atticus told me to delete the adjectives and I'd have the facts.” << one of many good lessons from Atticus. I forgot who said that, Scout or Jem? I left a link. Good job on your selection. I love the quotes you picked. Great quotes. Forgot that Book Thief one! i loved it so much when I read it. This was my favorite one to do and to read! I also did the Extremely Loud & Incredibly Close quote! Great quotes! - Especially liked Angelou and Tolstoy. GREAT To Kill A Mockingbird quote!!!!! Love it! Joining you from Kate's Library who linked to this post. There are some really great quotes here. One of my all time favourite reads I love the quote from The Book Thief but that aside I also love the one from Anna and the French Kiss which I'm told is a great read. Nice to have met you, I've enjoyed my visit. What a great concept (and meme)! Linked through from Meg's blog, "Love, Literature, Art & Reason." Amy & Roger's Epic Detour are my favourite writer. Excellent compilation about book quotes. I have compiled some quotes from you. Thanks for sharing.